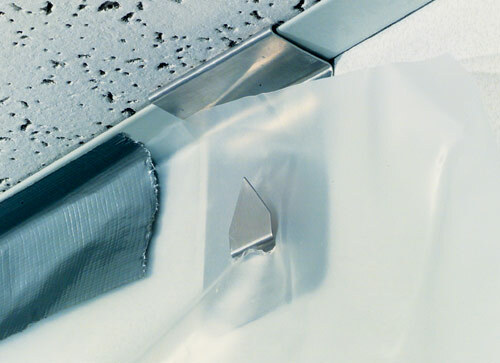 Poly Hangers securely attach poly sheeting to building surfaces to allow fast construction of dust barriers, containments, leak diverters andother temporary protection systems. Supports one or more layers of poly in front of walls. Hanger 1 slips behind wall molding and is supported by the vertical leg of the molding. Hanger 1 will also support poly in front of masonry or paneling by nailing into a joint which can be easily patched after tear down. Supports one or more layers of poly in front of walls. Hanger 2 clips over the horizontal leg of acoustic ceiling wall molding. 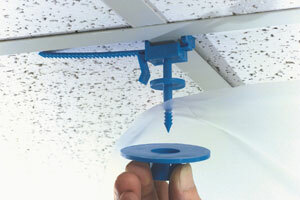 The prong makes hanging poly faster and ensures it will stay up during the length of the job. 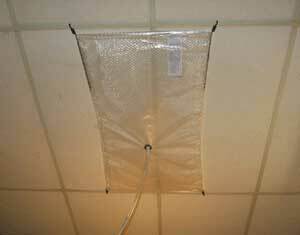 Supports poly from ceiling grid and other overhead objects. 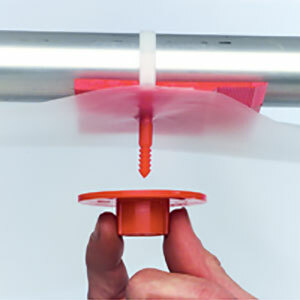 Poly is installed over the pin and is held in place by a removable retainer. Hanger 3 supports poly both horizontally and vertically for building full containments, connecting tunnels, dust curtains etc. Includes a 10" releasable cable tie so it can attach to many different components. 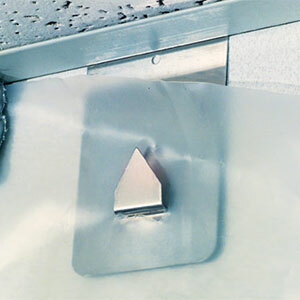 Divert roof and other leaks to an out of the way location to avoid creating dangerous wet floor conditions and to avoid disrupting customers and business operations. The Kit contains the materials necessary to build and install up to 3 leak diverters (at the same time), which can vary in size from 2’ x 4’, up to 8’ x 10’ or larger, and have flexibility to be configured to fit your leak situation. The components allow these leak diverters to be installed in about 10 minutes. The components are reusable and the only component you will need to replace at times is the poly sheeting.